This is a part of Nathaniel R’s Hit Me With Your Best Shot series, starring Anita Ekberg, CEO of LOLCats, and Marcello Mastroianni, curator of cool. 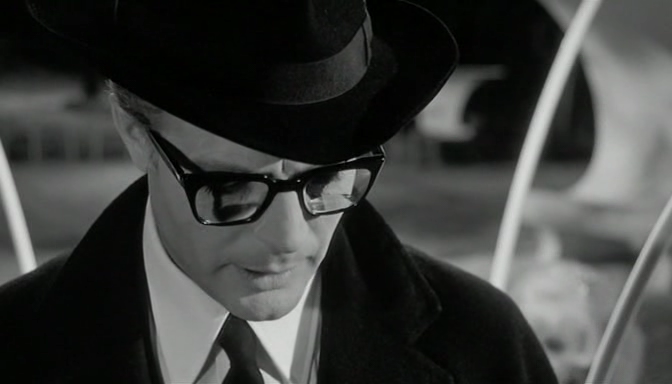 I’ve always had a love-hate relationship with Federico Fellini‘s work, mostly on the love side. There’s like one or two films of his that seem insipid and enforced schoolboy attitudes. But for the most part, he’s the guy that the stereotypically pretentious cineastes like, which is ironic because he’s so fun and silly and childlike and playful. This week, Nathaniel’s doing La Dolce Vita. I try my best in writing the most intelligent film criticism I can, but do you really want erudition out of a movie about Italians in their thirties partying it up? This movie was also my introduction to Anouk Aimee. I like her better here than in 8 1/2, but then I always like the flirt over the neglected wife. 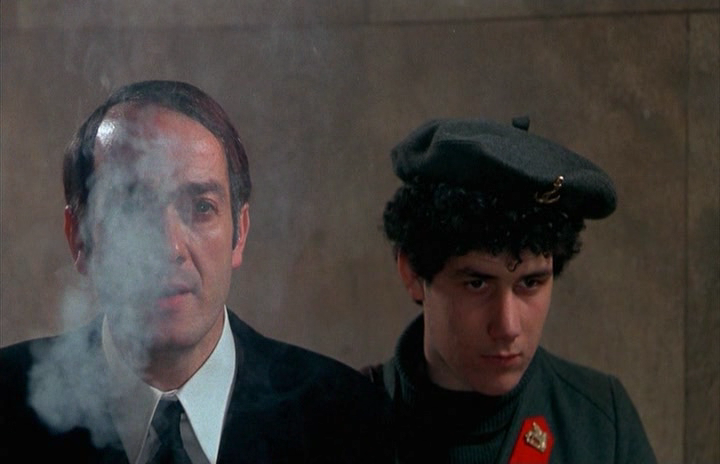 The picture above will also be the gayest moment in a Fellini film, second to all of Satyricon. Although someone correct me if I’m wrong. 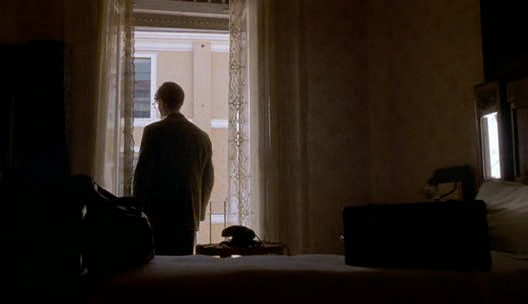 Nonetheless, here’s my favourite shot/sequence is the last one. It’s the morning after a party, two of the women spot a commotion on the beach. 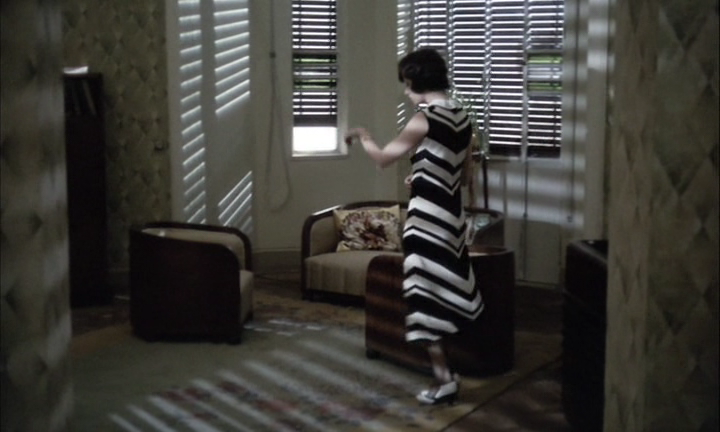 And of course, Fellini women don’t walk, they saunter. I don’t even remember the shots being like this. I remember them all walking to the beach from the right hand side of the screen. But really they walk through the forest area from the right hand side of the screen and they walk on the beach with their backs facing the audience. And of course I don’t remember how much the forest looks like a backdrop, but then those ‘painted’ trees look like they have dimension. I’m not gonna cheat and look up on iMDb whether Fellini filmed this in a studio or not. I just love how surreal the shot is. Not Bunuel surreal, no offense to him, but fun, playtime surreal. Here’s Marcello (Mastroianni) looking as fresh as an 18-year-old. I also don’t remember the film being almost three hours long, but if I was having this much fun, this movie could have gone on all night long. La Dolce Vita is playing today at October 10 and November 9 at the Bell Lightbox, but I kinda wanna see Rules of the Game too. Last chance: Tonight at 9 at the Bloor. I have work tonight so I can’t see it, but I already saw it so I’m ok. If you can, go see it. Or Saraghina will come after your child and give him an education and a gift that keeps on giving.